Ballymena-based printing firm Ballyprint is the first company in Northern Ireland to invest in the new Iridesse Production Press by Xerox, which can print impressive gold, silver, and coloured metallic effects. Every company is trying to get eyes on its promotional material, and the printing industry in Northern Ireland has exploded in recent years as more firms invest in the impressive equipment needed to produce high-quality fliers, marketing stands, business cards, and brochures. 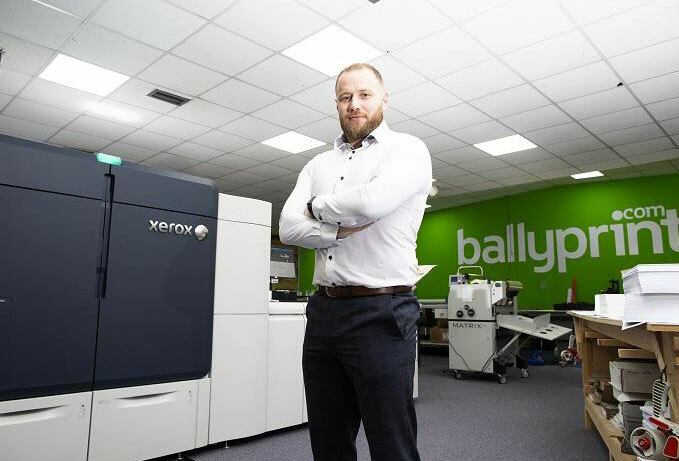 Now Ballymena-based firm Ballyprint has raised the bar again with a £300,000 investment in new equipment, including the new high-tech Iridesse Production Press manufactured by Xerox. This is the world’s first dry toner digital printing press that includes metallic gold, silver, white, and clear particles in addition to its full colour range, allowing the company to print impressive metallic and iridescent prints in a single pass. Ballyprint owner Aaron Klewchuk explained that the new equipment “has the ability to create an iridescent rainbow of metallic hues, mixed metallic with gold or silver, white ink and clear varnish in just one single pass, in fast turnaround times and at a low cost.” Ballyprint knows that there’s a market for gold and silver metallic print effects as its sister company Perfect Day Print creates bespoke wedding stationery. As part of the investment, Ballyprint hopes to increase its staff by 33% from 10 to 15 people in 2019 and plans to ramp up production to take advantage of its now greatly improved print capacity. “We are very excited to find out what creative solutions we can offer with this latest technology and what possibilities lie ahead for Ballyprint. We continue to seek out opportunities to grow, while continuing to offer exceptionally high-quality print solutions,” said Aaron Klewchuck.